We have a story like that for every situation. If it’s chilly, we talk about the year we were camping in a small trailer with one blanket per person and it got so cold, my Mom, my sister and I ended up in one bed so we could stack the blankets. If someone skins a knee on the playground, we remember the time my niece had to be rushed to the nearest emergency room because of a wrist injury during a game on the open field that preceded the playground. The campground itself has been the source of endless stories. It’s a landscaped wonder now, with two modern comfort stations that provide flush toilets and hot showers all festival long. Old-timers remember the years when you had to get up before dawn if you wanted a chance at a hot shower, and the septic tank backed up the first day of the festival. The pump-out guy used to camp behind the bath house in the old days, and he stayed busy all weekend long. Even older old-timers remember when the campground was just a field with one street light, one water spigot and a port-o-let. My children can all repeat the story of the time I caught my class ring on the door of the port-o-let and it tried to yank my finger off. My finger was fine, but there’s still a dent in my class ring. The kids have all seen it, and they’ve heard the story countless times, along with countless other festival stories. They’ve added some of their own. Every year adds something to our personal collection of Florida Folk Festival lore and this year has been no exception. It was already the year The Makley Family became the Makley Duo after unforeseen circumstances (including emergency surgery) led to cancellations by three group members. You’d think that would be enough for one year, but it seems that was only the beginning. 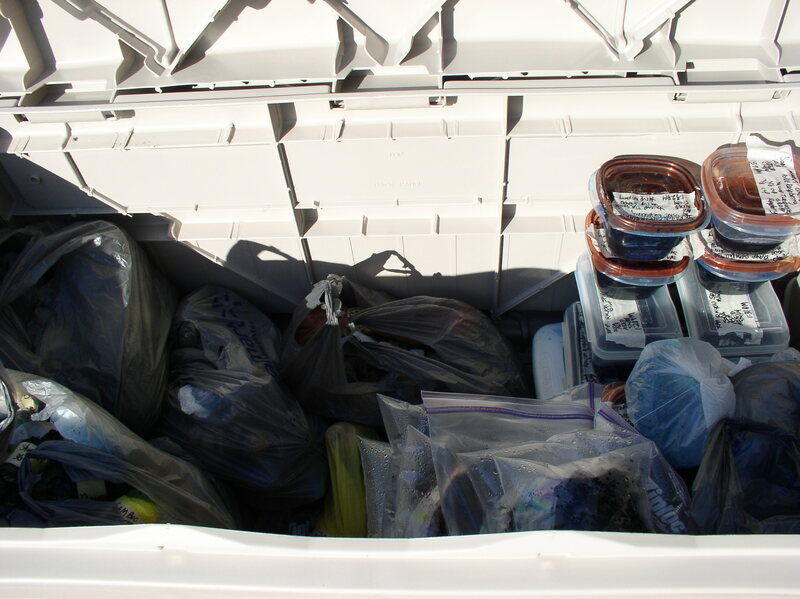 Friday morning, the first day of the festival, my daughter and I loaded the things we needed for our day into my car and started to head up to the vendor area. We had barely pulled out of our campsite when we heard a sound. A mysterious sound, but a familiar sound. I stopped the car and my daughter got out to check. 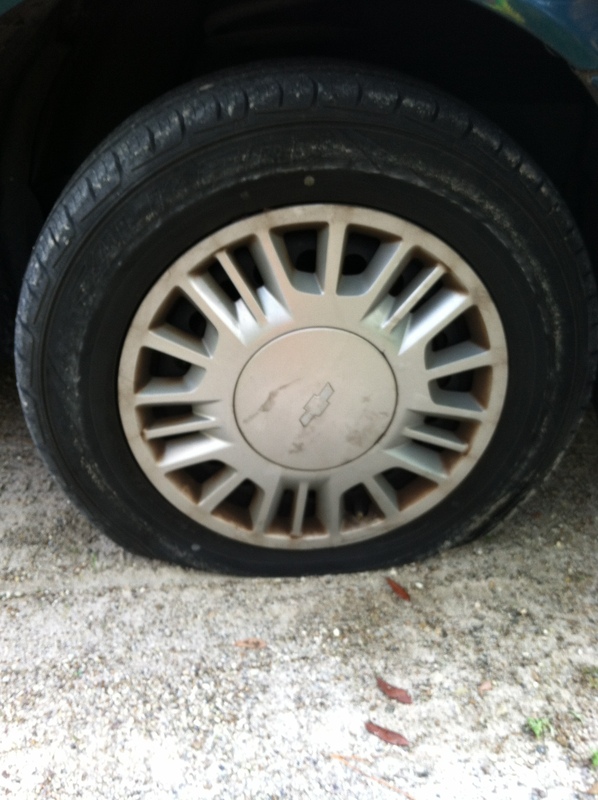 Oh, yeah…that was the sound of a flat tire. We shifted all our necessary items into my husband’s van and took that up to the tie-dye booth, leaving my husband to deal with the flat tire. He enlisted the help of my brother-in-law and by the time I returned to the campground at the end of the day, I had a new tire. Things were looking up. Saturday, we took my car up to the tie-dye booth and had a relatively uneventful day until about seven o’clock, when we were closing up the booth and listening to the last act of the evening on the Old Marble Stage. Suddenly, we could no longer hear the act on the Old Marble Stage. The power had gone out. We went back to the campground and found that the power was out there, too. We heard it was out, not only in the whole Stephen Foster Folk Culture Center State Park, but in the whole town of White Springs, where the park is located. Someone had crashed a truck into a very important power pole. A park employee, who was putting up signs at the comfort station saying it was closed due to power outage, told us they were hoping to have the power back on by eight-thirty. I couldn’t wait that long and I’m not a guy, so I hiked out to the port-o-let by the North gate of the park. This one did not try to yank my finger off. Of course, I was not wearing a class ring at the time. I imagine the primitive campers were feeling quite smug until a little after nine o’clock, when the power was restored and a huge cheer erupted from the campground. Our refrigerator was back on and so was the air conditioner in our little blue teardrop trailer. Things were looking up. Sunday was bright and hot, but not as hot as Saturday and certainly not as hot as that one year. We had a busy, fun day and were starting to pack up the tie-dye when we noticed dark clouds gathering in the sky. Instead of folding up the T-shirts and packing them in bins, we rushed to pull everything into the tent and zip up the side panels. Then we ran to the car and drove back to the campground in a heavy downpour, praying the tie-dye would be all right until morning. It was all right, but it was all a bit damp, which is why I have racks of T-shirts in my living room right now. It would have been okay to start folding them today, but the air conditioner in my house stopped working the night we got home from the festival and the repairman couldn’t come until this afternoon. Folding up the tie-dye is a big chore and we’re not going to do it in an overheated house. The repairman just left and the air conditioner is functioning again. Things are looking up. This entry was posted in Uncategorized and tagged camping, Florida Folk Festival, Stephen Foster Folk Culture Center State Park, stories, teardrop trailer, The Makley Family, tie-dye on May 28, 2014 by releaf1954. I’m sitting in the customer lounge at my car dealership, waiting while they change the oil and rotate the tires on my ancient car. Why I put this off until the day before I have to leave for the Florida Folk Festival, I will never know. This is something I could have taken care of weeks ago, but I didn’t, so here I am. At least I’m multitasking. Last year, I didn’t even publish a blog post from April through June, so I’m obviously doing better this year. Not only am I writing a blog post the week of the Florida Folk Festival, I actually managed a painting this week. Yes, it’s a tiny painting, but it still counts. 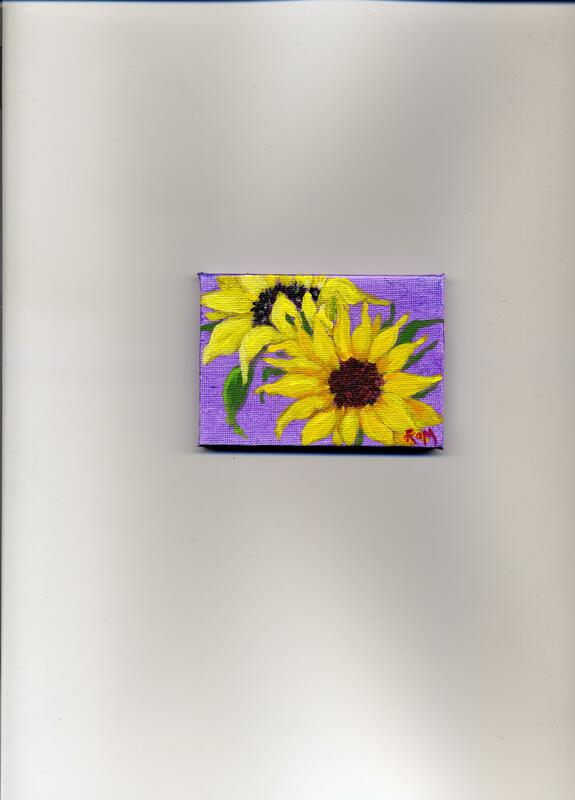 I decided to have a little more fun with the sunflowers before they wilted, so I painted a close-up of two of the blooms on one of my itty bitty canvases. I’m proud of myself for keeping up with all this in my busiest month of the year. Once this oil change is finished, I will still have a lot of shopping and packing left to do, but the tie-dye is all completed, sorted and ready to load in the truck. Things have been going so smoothly, I started to wonder when something would go wrong. I should know better than to do that. I did it two years ago when we finished everything on time and headed off to the festival with a forecast of partly cloudy skies for the whole weekend. I’m still not sure where that tropical storm was hiding while it was planning to run us out of the festival campground a day early and make us pack up in a torrential downpour, but I thought I had learned my lesson about wondering what could go wrong. Not quite, apparently. All the tie-dye was finished on Saturday. We were just sorting and tidying up and planning my hair-dyeing session when I checked Facebook and saw that my sister, who is a very important part of the family yodeling act, was in the hospital. She was waiting for tests to determine whether or not she would be able to drive from New Jersey to Florida to perform at the festival. Turns out she needs gallbladder surgery, which is happening today. She will not be attending the Florida Folk Festival. She is our lead singer, chief arranger and best guitar-player. We will persevere; we’re used to making adjustments, but it’s definitely going to be a challenge. The important thing, of course, is my sister’s health. Please keep her in your thoughts and prayers as she recuperates. We will certainly be thinking of her as we switch parts and decide which songs can be done with autoharp instead of guitar. The show must go on. At least I have colorful hair. 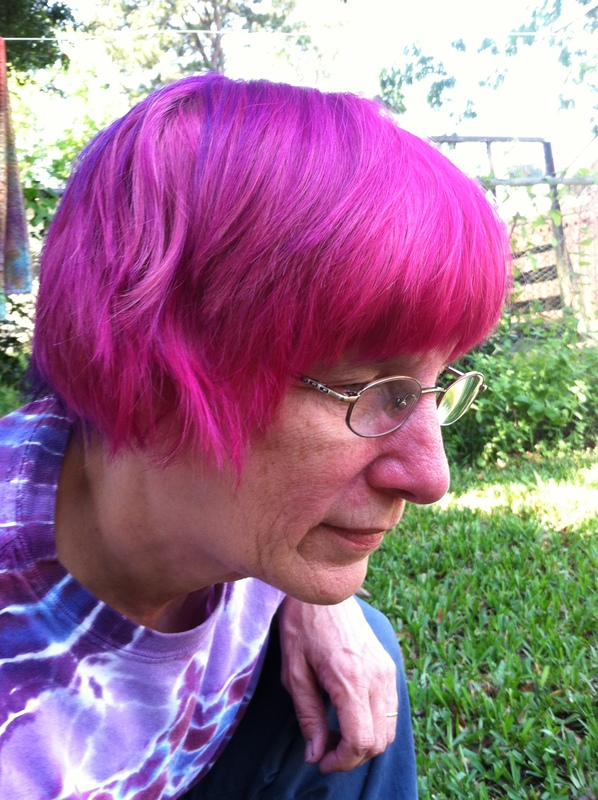 This entry was posted in Uncategorized and tagged colorful hair, Florida Folk Festival, painting, tie-dye, unexpected news on May 21, 2014 by releaf1954. Last week, I wrote about Mother’s Day and how I hadn’t been able to take that day off from making tie-dye since we started getting ready for our first Florida Folk Festival in 2008. This week, I can tell you that I spent my 2014 Mother’s Day resting and having fun with my family. All of my children and grandchildren came over for a backyard cookout and my husband did the cooking. It was a lovely day, in spite of the fact that my husband had to pull the grill under our dyeing canopy and run through a storm to bring in the hot dogs and corn. Since I had met my dyeing goals on Saturday, I was able to take some time Monday morning to paint. I had picked up some sunflowers at the grocery store on Sunday, with the hope of finding some painting time before they wilted, but I went outside early Monday morning to put Onesies into pre-soak and the backyard garden caught my eye again. I was feeling brave, so I decided to try painting outdoors. 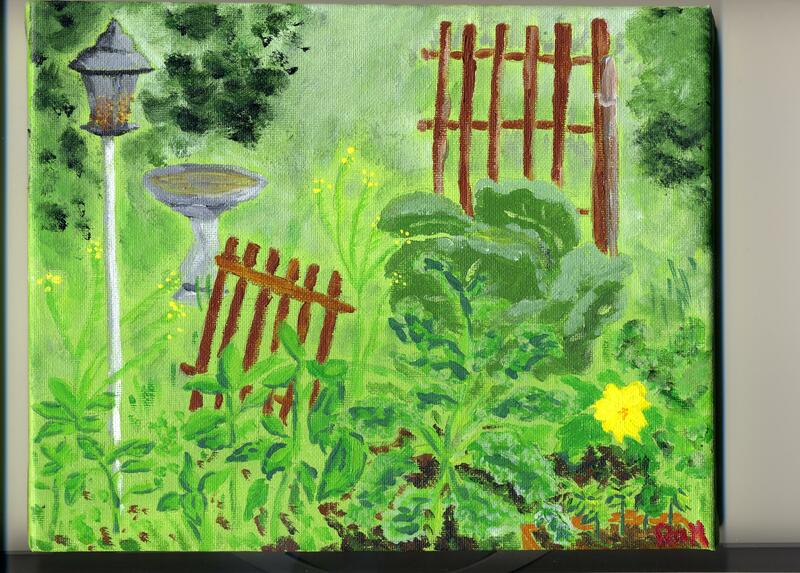 Once the Onesies were up, I brought out my easel and paints to try and capture the garden before the squash blossom closed up and the Onesies got dry. Let’s call this a learning experience. The difficulty level was way beyond my skills and my inner critic had a field day telling me that I was hopeless at painting and I would never get any better and I might as well give up. I heard the voice but I didn’t pay it much attention because the act of painting had put me in a good mood for the whole day. 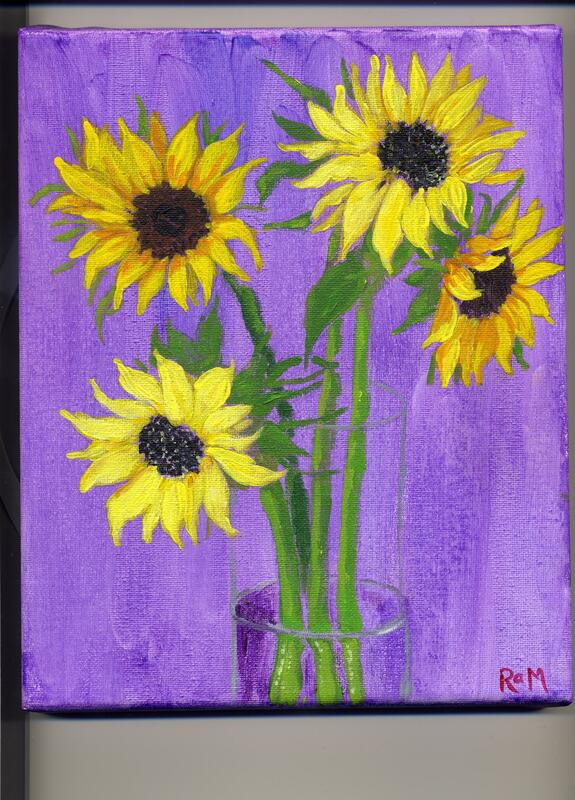 I did want to try something easier the next time, though, so on Tuesday, I painted the sunflowers. My daughter called just as I was finishing up because it was time to get started on the rinsing. I brought her to my house and she admired the sunflower painting. Then she pointed out something I hadn’t noticed – the difference between this painting of sunflowers and the first sunflower painting I had done in early March. Here’s the one I did yesterday. My skills are definitely improving. In your face, inner critic! 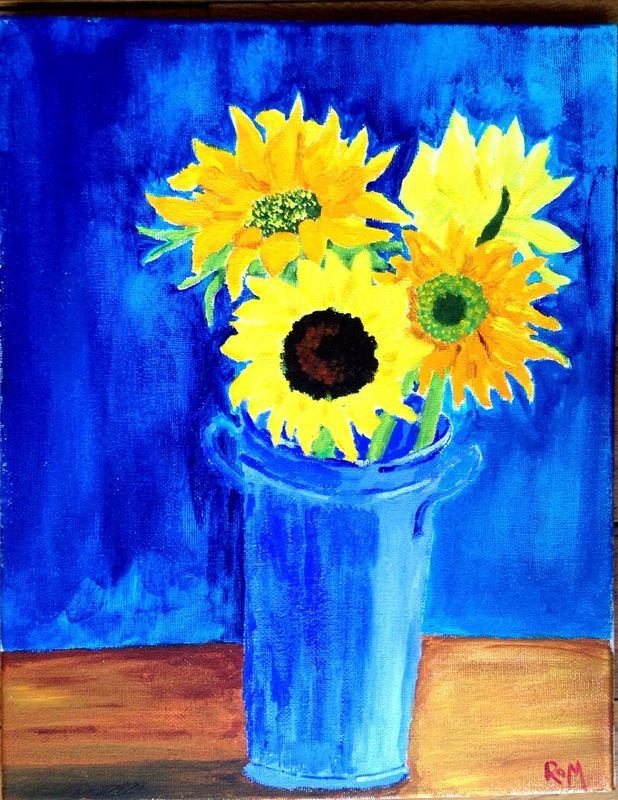 This entry was posted in Uncategorized and tagged improvement, inner critic, Mother's Day, painting, sunflowers, tie-dye on May 14, 2014 by releaf1954. The first time we agreed to be vendors at the Florida Folk Festival, we drove ourselves nuts trying to make enough tie-dye. 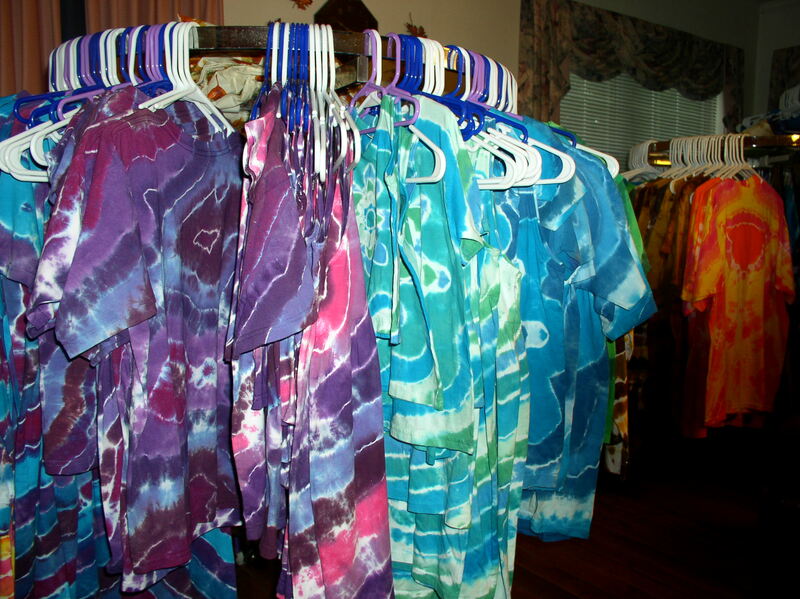 We had not planned to sell tie-dye at the Florida Folk Festival in 2008. We had only taken our first tie-dye workshop in 2006 and we intended to grow our business slowly, trying out small events close to home as we learned the ropes. The Florida Folk Festival was way out of our league and besides, our mentor was the tie-dye guy at the Florida Folk Festival. He freely shared his knowledge with us and there was no way we would compete with him at his biggest event of the year. Our plan for 2008 was to take things even slower than we had in 2007 because my daughter (who is my business partner and does all the tying) had decided that late 2007 or early 2008 would be a good time to have a second child. She was in her third trimester when we heard the news that our generous tie-dye mentor, Mark Wright, had been found, slumped over his half-finished tie-dye, dead of a heart attack in early middle age. Our whole folk community was shocked and saddened by this news. That was in late October of 2007. In November, the organizers of the Florida Folk Festival asked us if we would be the new tie-dye vendors in 2008. We’ve been part of that folk family for decades and we felt that Mark would want us to do our best with the knowledge he had given us, but we were far from ready for such a huge event. Even without the complication of a new baby in January, it would have been difficult. As it was, it was nearly impossible, but we did it anyway. I held the baby while my daughter was tying. She held him while I was dyeing. Mother’s Day came in the middle of the rush and I spent it outside all day, making tie-dye in the heat. I thought it would be nice to take a break on that special day, but there just wasn’t time. The sun was shining; I had to be making tie-dye. I worked a lot of twelve-hour days that Spring, and Mother’s Day was one of them. I had no choice. Time was short and we needed all the tie-dye we could finish by festival time. We were still rinsing things out the day we left for the festival. Ever since that first year of Florida Folk Festival preparation, I have had the dream of actually resting on Mother’s Day. They haven’t all been twelve-hour days in the years since 2008, but they have all been work days. I have not been able to get enough done in advance to take a day off in early May. I have high hopes that this year might be the year. I have three-and-a-half color palettes to finish and I have three days left before Mother’s Day. One of the color palettes does have a lot of items in it, but the others are not as full. Mother Nature may also help me out this year. My daughter tells me there’s an eighty per cent chance of rain that day. I hope there aren’t too many people praying for sunny weather on Sunday. I think rain would be perfect. I’ll let you know how that turns out when I write next week’s blog post. This week, I can report that the new deck box we bought last week is working out well. It sure holds a lot of tie-dye! This entry was posted in Uncategorized and tagged Florida Folk Festival, long work days, Mother's Day, tie-dye on May 7, 2014 by releaf1954. I was pretty sure I would not have a painting to blog about this week. We’re into May now, and that means all our time needs to be spent making tie-dye. We’re getting ready for our biggest event of the year. It’s the Florida Folk Festival and it happens on Memorial Day weekend, which comes particularly early this year. We’re down to just three weeks and that makes every day a work day. If the sun is up and it’s not storming outside, I need to be making tie-dye. When the sun came up this morning, it was not storming outside. I allowed myself time to eat breakfast and then I went out and started making tie-dye. I was working on Purples and I had dyes left from yesterday, so I was able to get right to work without mixing. After a while, I ran out of Deep Purple and Warm Purple, so I went into the garage to mix more dye. I had thrown a plastic tablecloth over my chest freezer to turn it into a mixing station and I mixed up the Deep Purple with no trouble. Then I put the ingredients for Warm Purple into my blender and turned it on. I went outside to rinse my measuring spoons in the bucket of water I keep by my dyeing table and I heard a strange sound from the blender in the garage. I ran back in there and the darn thing was smoking. I hit the off button and pulled the plug. I don’t know much about blenders, but it’s my considered opinion that when one starts smoking, it’s time to get a new blender. This required a phone call to my daughter. I was in urgent need of a blender but I knew I didn’t want to get the same brand as the one that just went up in smoke. It hadn’t lasted a year. Our first blender lasted six years, but it was the same brand, so I had no clue what blender to try next. All I knew was that my daughter would have an opinion. My daughter always has an opinion. She researches everything online before she buys anything. She reads reviews. She canvasses her friends. She does her homework. I was desperate for an opinion and she did not fail me. She said I should get a blender like hers. I asked where she got it. She said she got it at Target and if I was going to Target, she wanted to come along. She needed kitty litter. I needed to be dyeing but I couldn’t dye without a blender, so I picked up my daughter and we went to Target. She had to wake up her husband to watch the kids, but all she had to say was “blender emergency” and he completely understood. We’re tie-dye artists. It’s our busy season. There was no time to lose. Of course, once we got to Target, we managed to misplace some time. My daughter needed a few other things besides kitty litter. 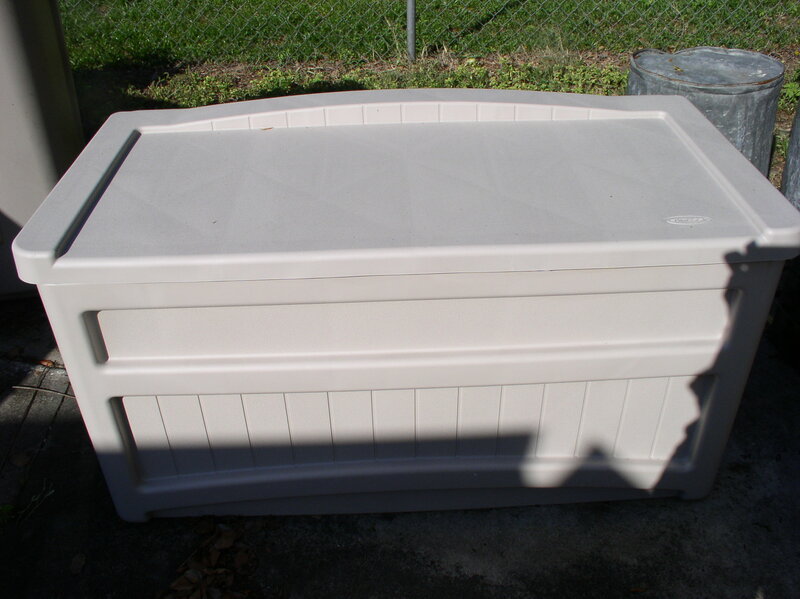 We had been thinking about buying a deck box for the business ever since my husband sold the old RV where we used to store the tie-dye while it was batching. This seemed like a good time to take care of that, so we balanced a large deck box on top of our shopping cart, which didn’t exactly speed up our progress through the store. By the time we got back from Target, it was almost noon. When we did our first Florida Folk Festival, we skipped a lot of meals in order to get enough tie-dye done before Memorial Day weekend. The upside was that we both lost weight (actually, that was only an upside for me; my daughter never needs to lose weight). The downside was that we were totally exhausted and were unable to actually enjoy the festival. We could barely manage to be charming to our customers. Well…polite, anyway. The point is, we are no longer willing to skip meals in order to make more tie-dye. We stopped for lunch. After lunch, we went outside. I set up the new blender while my daughter put the new deck box together. I mixed my Warm Purple dye and I started working on my Purple Rayons. There were only three of them and I was still trying to finish the last one when the rain started coming at me sideways. I was working under a canopy, but I couldn’t endure sideways rain. Or lightning. I packed up and came inside. I thought about starting my weekly blog post, but my daughter (who was tying things at a table in my living room) said I should paint. There really was nothing I could do about the tie-dye in the middle of a storm, so I allowed myself to paint. 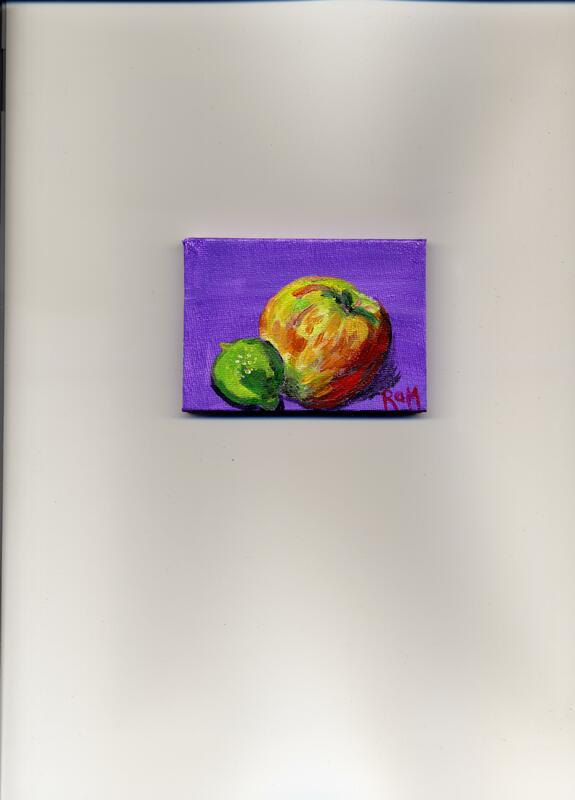 I didn’t have a lot of time, so it’s another itty bitty painting, but it is a painting. It counts. This entry was posted in Uncategorized and tagged blenders, Florida Folk Festival, painting, shopping, tie-dye on May 1, 2014 by releaf1954.